On November 28, in Torino (Italy), Salvatore Cherchi's OPI 2000 will promote a major show at Le Cupole sports palace with former WBC Silver heavyweight champion Carlos Takam (WBC n.7, IBF n.10 and WBO n.13), current European super middleweight champion Hadillah Mohoumadi (WBC and WBA n.7, IBF n.15 and WBO n.11) and local fan-favorite Andrea Scarpa (18-2) who will fight Lyes Chaibi (France, 14-8-2) for the vacant IBF Intercontinental super lightweight title. Scarpa is a former Italian champion in two weight divisions: super featherweight and super lightweight. 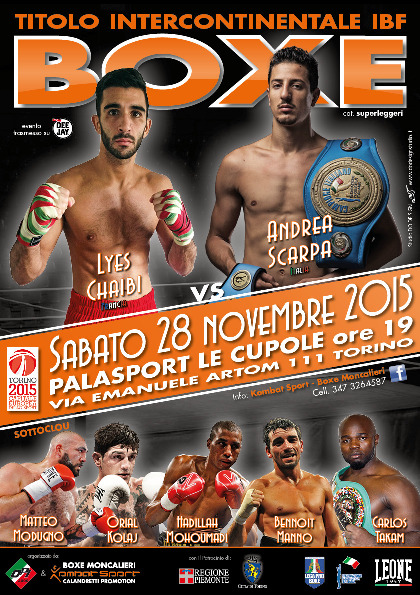 Scarpa’s bout will be broadcast in Italy by Deejay Tv, in Poland by FightKlub and in France by L’Equipe 21 Tv. The French network will also broadcast the fights involving the other French boxers: Hadillah Mohoumadi (19-3-1) will fight Eric Torres Marin (Hungary, 8-6-1) in a 10 rounds non-title affair, while Carlos Takam (32-2-1 with 25 knock outs) will face George Arias (56-14 with 42 kos) on the 8 rounds distance. Takam defeated Michael Grant, Tony Thompson, Michael Sprott, drew with Mike Perez and lost to Alexander Povetkin. George Arias will be a tough opponent: he fought all over the world and only lost to guys like Owen Beck, Juan Carlos Gomez, Kubrath Pulev and was stopped only four times. All in all, on November 28 Italian boxing fans will have the opportunity to see a world class show.